The moment I noticed that the train had arrived at the platform, we quickly boarded the train as we did not want to wait another 30 minutes if we'd missed this one! We didn't know until we boarded the train that our tickets were actually for Windsor & Eton Central Station but the train was going to Windsor & Eton Riverside Station! 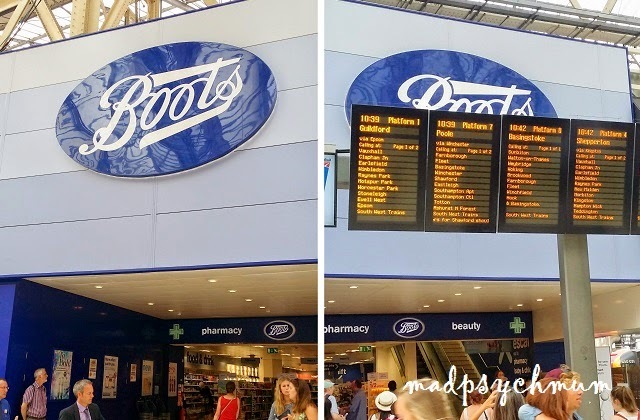 I had neglected to check the National Rail Map and had just assumed that when my colleague said to take the train from Waterloo Station, it would go to Windsor & Eton Central Station. Since both stations were very close together (and we didn't want to waste precious time), I decided to take a chance and see if they would allow us to exit the station. 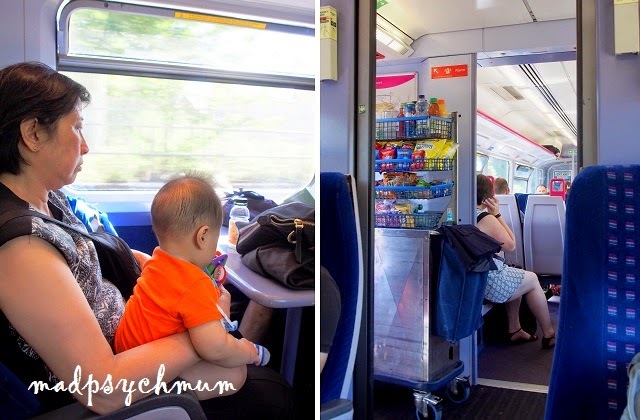 The train was really spacious, with ample spaces for strollers and wheelchairs. We thought it was a lot more comfortable than the tube! 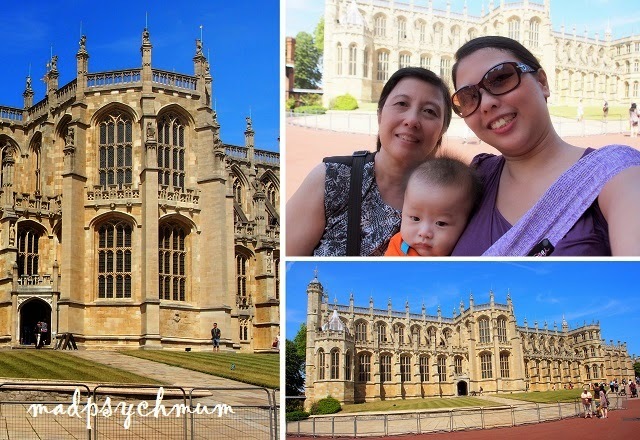 The train was really fast too and it took us less than an hour to reach Windsor & Eton. We had no idea how to get from the station to Windsor Castle so we asked the lady of the small drinks store at the station for directions. "Turn right, walk down the road to the traffic light, cross it and go up the hill.." she answered, with an as-a-matter-of-fact-cos-I've-said-it-a-billion-times voice. "Thanks!" I said, truly grateful for her help even though I knew it wasn't easy for her to repeat the same instructions to every tourist that passes through the station. And up the hill we climbed indeed, in the heat of the mid-day sun! 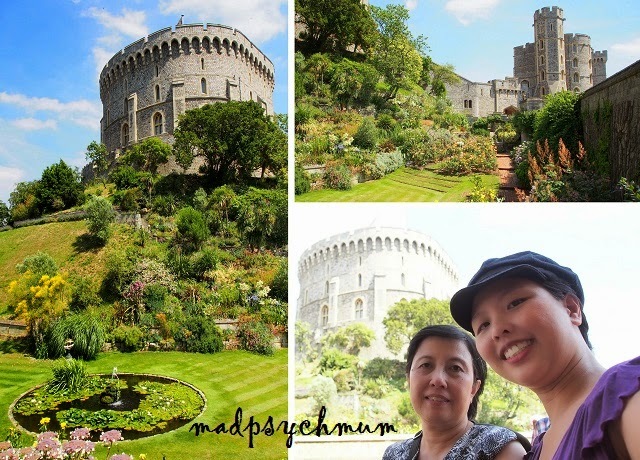 Finally, we have arrived at Windsor Castle. To be able to see a real castle in person after only seeing them in movies (mostly Disney of course) was breathtakingly amazing! I was, of course, beyond excited! 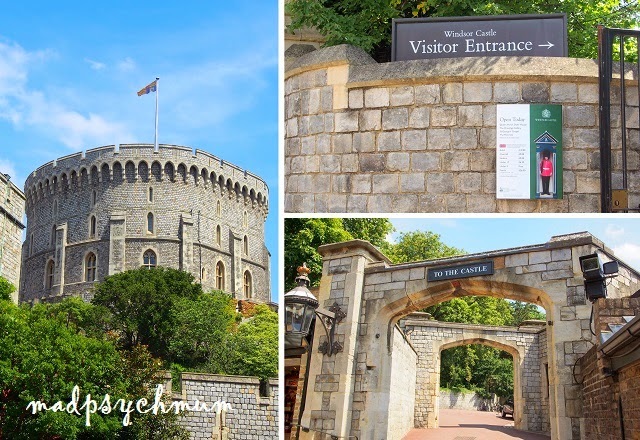 Clockwise from left: The flying of The Queen's flag on top of the Round Tower indicated that the Queen was in! Walking into the large castle grounds! We didn't get to see The Queen so we moved on to the next attraction to see Queen Mary's Doll House and the Royal Collection. And guess what we saw while waiting in the queue! No photography was allowed in the gallery of the Royal Collection but my itchy fingers couldn't help but take one (ok some but who's counting?). 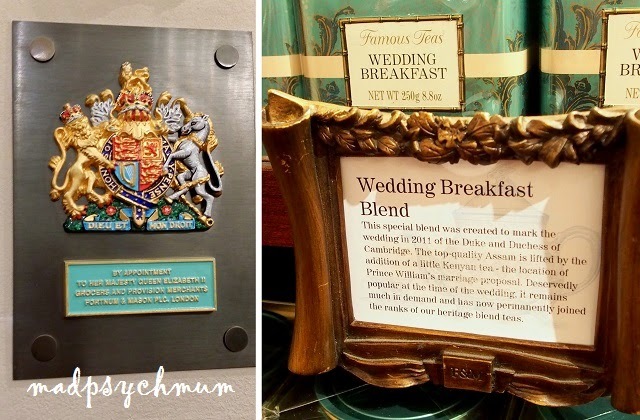 I also enjoyed seeing the historical pieces found in the Royal Collection, such as King Albert's letter to Queen Victoria when he was still courting her and the hand-painted China presented to the royal family by various countries. 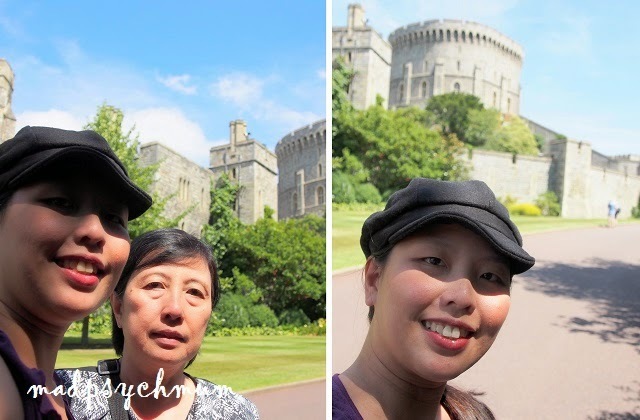 We continued to explore the rest of the castle grounds after we emerged from the exhibition. And that concluded our tour of Windsor Castle. 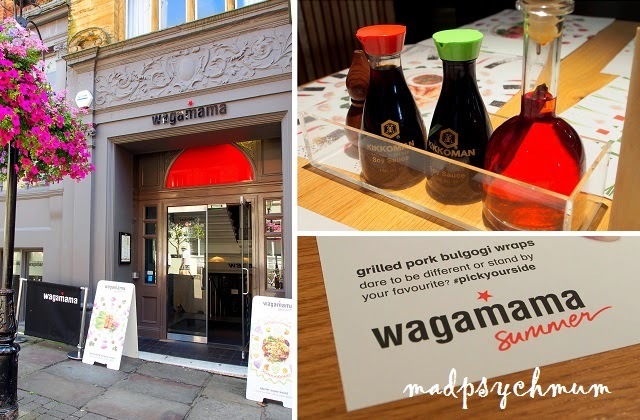 We were famished so we had our lunch at Wagamama, which came recommended by my colleagues. 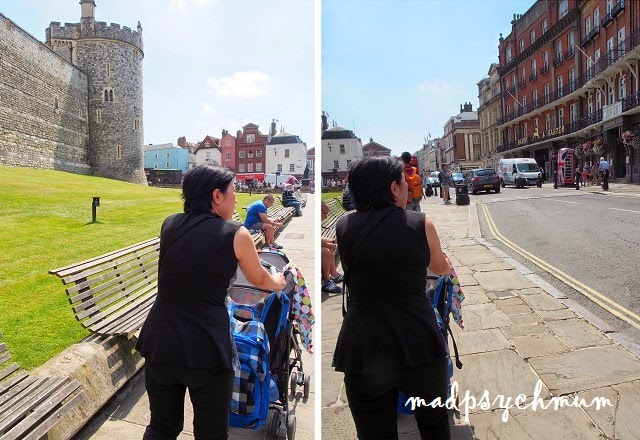 When we were full and very happy, we headed back to London via the national rail at Windsor & Eton Central Station (the correct station this time). 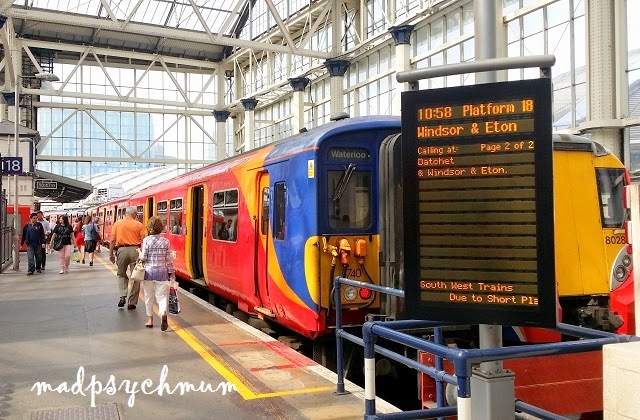 The train from Windsor and Eton Central Station does not go directly to London. 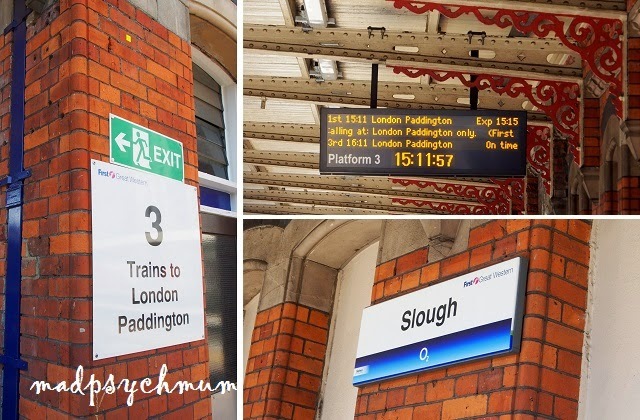 You'd have to change at Slough Station to the train bound for Paddington Station, the place we visited on the 2nd day. 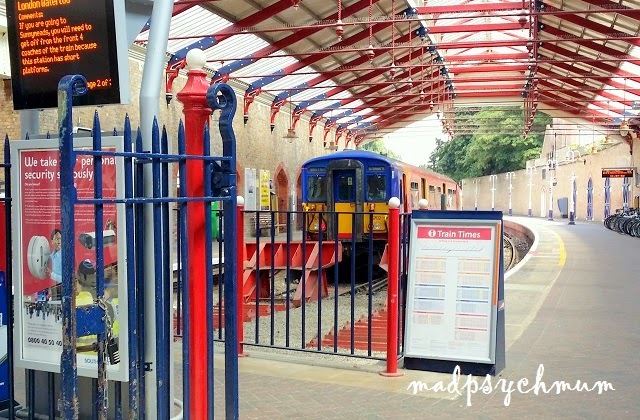 (This station is wheelchair friendly, although the lifts were quite far away. We arrived at Paddington Station and asked a nice security officer for the direction to the Circle line (yellow). "Where are you going?" he inquired kindly, to which I replied "Buckingham Palace." "Ahh, exit at Victoria Station. Victoria." he said with conviction. I had actually intended to exit from a different station but since he sounded so sure, I decided to heed his advice. "And take care of your belongings.." he continued as we were leaving, "especially this little fellow (pointing to the boy). There're a lot of thieves out there!" We smiled and thanked him for his help. "Now that was nice," I thought to myself. 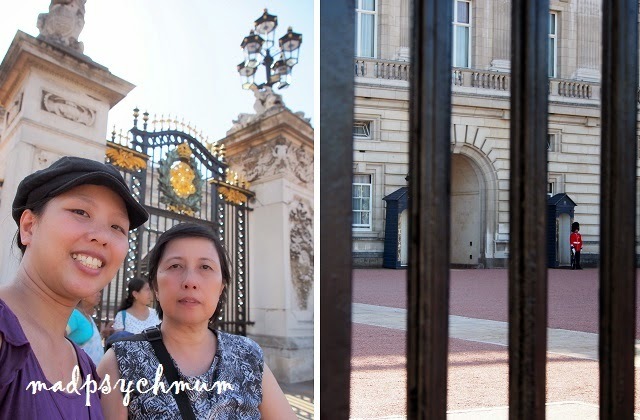 We took the Circle line (yellow) to Victoria Station as advised and followed the signs until we arrived at Buckingham Palace. It was about a 10-15 minute walk but it felt longer because the sun was scorching hot! It was so hot that I couldn't take a decent photo of the shiny monument. 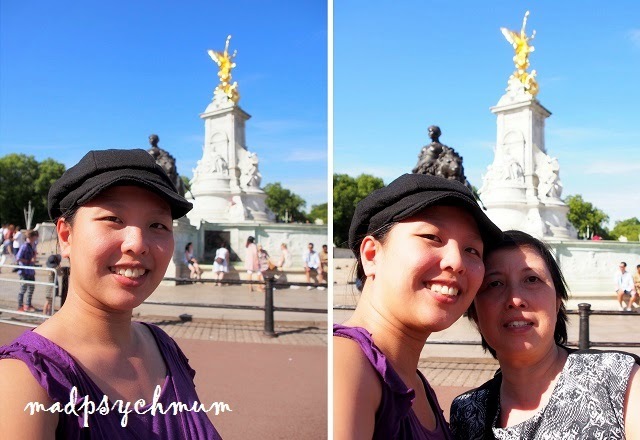 We walked around the monument once and couldn't wait to leave! We scooted as fast as we could to the nearby Green Park to escape the heat. It was quite an enjoyable walk. The parks here are really lovely. Even Her Majesty, The Queen, gets her groceries delivered from here! Obviously i had to buy some tea and chocolates. I wanted to buy the tea set as well but I don't think that I will be able to transport it back to Singapore without cracking it! Looks like I'll just have to get mine from Robinsons or something. We walked back towards Green Park along Piccadilly Road to Clarges Street, to have dinner at the popular Burger & Lobster. However, all the tables in the restaurant were occupied and we would have to wait at least 30 minutes. The bar area was available but we had a baby with us and they did not have a baby chair so we really couldn't eat at the bar. 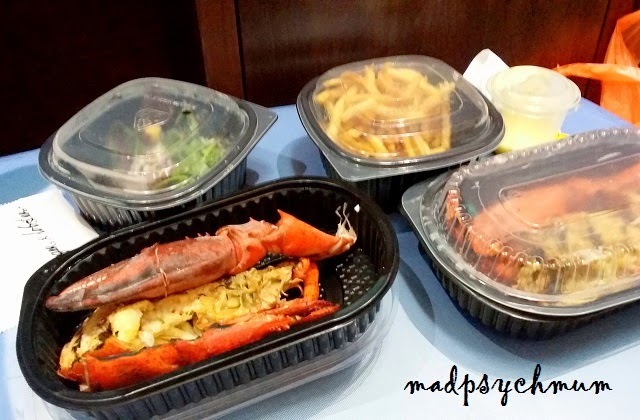 Mum was too tired to wait so I decided to take away their signature lobster set (GBP 20) to eat at our hotel instead. 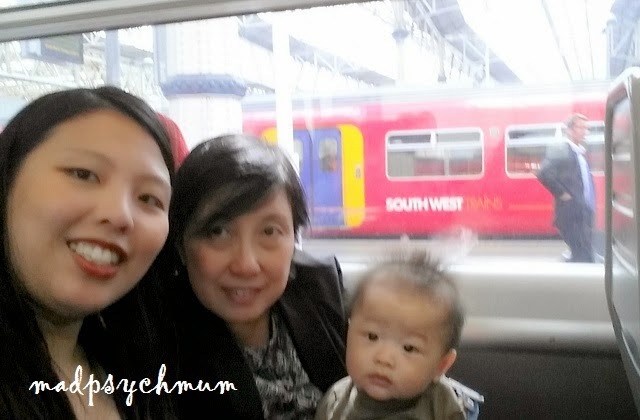 We took the tube from the nearest tube station, Green Park Station, back to Hammersmith. I couldn't wait to rest our feet and dig into the lobster that my colleagues had gushed about.